Battle of the Olive Oils? European olive oil producers—from Spain, Italy, and France—have traditionally dominated the market. But blessed with a climate perfect for growing olives, more and more California olive growers are investing in olive mills and using mechanized harvesting methods that put the Golden State’s olive oil industry on a par with Europe’s. According to Paul Vossen, an olive specialist at the University of California in Sonoma, California farmers will plant about 2,000 acres of olive trees for oil this year, increasing land for oil production by about 30 percent. He also predicts that this land expansion will continue to increase the same amount through 2009. The same California climate that produces great wine is now producing great olive oil. Olive trees are being planted with haste, and olive oil may be the next big industry for the state. Above, one of our favorites: O Citrus-Infused Olive Oils. Click here for our review. In 1871, the first commercial production of California olive oil took place at the Camulos mill in Ventura. While small amounts of artisanal oil continued to be produced by family farmers, gourmets and vintners in Northern California re-sparked the interest in high quality olive oils over the past decade. While lower overseas production costs led to the ascendancy of European oils, new mechanized equipment enables California farmers to remain fairly competitive at the high end of the spectrum. During harvest, projected to start this week, workers will use mechanical picker instruments to collect the ovoid fruit from the trees and take them to the mill. With a mechanical picker, the process to retrieve the olives and extract the oil now only takes 90 minutes, and two people can gather in an hour what normally takes 40 people to pick by hand. With its delicious flavor and studies showing health benefits, olive oil bottles have been lining the shelves in American homes. The California Olive Oil Council reports that currently, about 65 million gallons of olive oil are consumed in the U.S.—eight times the volume of 20 years ago. Although California may have an edge on the olive oil industry, only 1 percent of the oil produced is imported. In 2004, California produced 383,000 gallons of olive oil, nearly a 25 percent increase over 2003. U.C.’s Vossen estimates its retail value at about $85 million, a minuscule fraction of the $15 billion value of the Golden State’s wine industry. The November issue of THE NIBBLE focuses on gourmet olive oils. You can read about them here, beginning November 1. Chilean Sea Bass Near Extinction? Despite American attempts to boycott the nearly-extinct Chilean sea bass through fishing quotas, the fish sells easily for as much as $20 a pound in the United States—almost quintuple the cost in the 1980’s when it first hit the American markets. Considered to be one of present-day’s most valuable fish, the Chilean sea bass can cost more than $1000 for an entire piece. as much, now that there is a shortage. Photo courtesy of AIDA. A quarter of a century ago, the fish then called the Patagonian toothfish was known only to Antarctic scientists. Then it became “discovered” as a food fish: its flaky and simple-to-cook meat made it popular in restaurants as well as a substitute for the once common and increasingly costly cod. According to Mark Kurlansky’s book Cod, cod from the North Atlantic sustained large populations until the 1970’s, when catches began to decline. Due to free-market policies under Augusto Pinochet, southern Chile was the next stop for fishing: the Patagonian toothfish was discovered and the Chilean sea bass craze was born. According to a report published in 2003 Report to Congress: The Status of U.S. Fisheries, between 90 to 99 percent of some of the ocean’s major predators are near-extinct (the thick-fleshed “major predators,” which are species that many people prefer, include cod, tuna and Chilean sea bass). Although these almost-extinct fish stocks are being replaced by farm-raised products, the aquacultured production cannot match the ocean’s natural production. While governments dictate laws that require “sustainable management” of fish stocks, it is difficult to police fishers who need to make a living. Experts like Dr. Daniel Pauly, director of UBC Fisheries Center, believe that a “crop-rotation system” is a necessary measure to sustain a number of fish and other ocean species. The crop rotation would designate periods of time where parts of the ocean are off limits to fishing. Nowadays, restaurants are more than likely to be serving aquacultured fishes—farm-raised—like tilapia or branzino. Just as cattle replaced wild buffalo, we may soon be having farmed fish over wild. But as farm production can’t keep up with what we used to pull from the sea, the questions is: will we be seeing less fish on menus and in the market any time soon? You can help by knowing what fish are not endangered, and purchasing those at the supermarket and restaurant. Seafood Watch is a not-for-profit organization dedicated to sustaining the world’s natural seafood population. Click here to read more about it, and the free pocket guide you can download. Vino de Milo Hits the Shelves at Wild Oats. One of our favorite lines of sauces is now available more widely at retail. Vino de Milo, produced by Milo’s Whole World Gourmet, these wine-based pasta and entree sauces are now available in 70 Wild Oats Natural Marketplaces nationwide. Made in small batches with fresh herbs and vegetables, each of the 6 varieties is all-natural, and contains no sugar, additives, saturated fat, artificial coloring, or preservatives. these wine-based sauces at Wild Oats. The sauces include Bombay Cabernet, Mediterranean Pinot Grigio, Portobello Shiraz, Tuscan Merlot, North African Pinot Noir, and Spicy North African Pinot Noir. If you aren’t near a Wild Oats, you can always purchase them online. 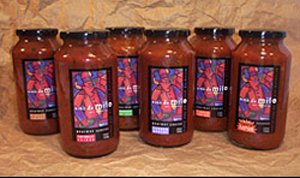 See our review of Vino de Milo sauces, including online purchasing information, here. The French Protect Their Foie Gras. We’ve seen The Governator terminate our right to eat foie gras in California (as of 2012, the force-feeding of birds will be illegal, as will sales of products made from force-fed birds). Other states like Illinois are considering the same. But who would think this debate would take place in the homeland of foie gras, France? 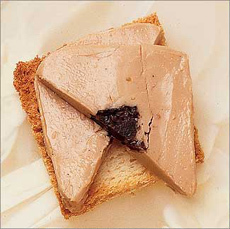 French law protects foie gras and declares it to be a food that characterizes the originality of the French food model. The measure, an amendment to an overarching agricultural policy bill, was passed unanimously on Monday. The full draft bill passed 376 to 150. When defining foie gras, the French lawmakers openly referred to it as “the liver of a duck or a goose specially fattened by force-feeding.” Deemed to be a delicacy of southwestern French cuisine, foie gras is considered “an emblematic element of [France’s] gastronomy and our culture,” as explained in the amendment. This new amendment met with disapproval from animal advocacy organizations and governments, which criticize the force-feeding of geese and ducks so that their livers swell to up to 10 times normal size. The lobby against foie gras is particularly prominent in the United States, which led to the 2004 California ban on the stuffing of ducks and geese for foie gras. When deciding on the protection status of foie gras, lawmakers found that even amid the opposing views and research, foie gras symbolizes a unique entity of French food. Lawmakers explicitly note that France produces 83 percent of the world’s foie gras and eats more than 90 percent of it. More Ways to Enjoy White Tea. White tea is one of the rarest teas in the world, so-called for the delicate, silvery white hairs covering its buds. The buds—not the leaves used for green and black teas—are hand-plucked and dried naturally with no fermentation or steaming, enabling white tea to retain highest concentration of polyphenols, which researchers believe makes white tea the most antioxidant-rich tea available on earth. That’s why those who drink tea for its healthful antioxidants often turn to white tea. However, white tea in its purest form is very subtle in flavor. While many East Asian tea drinkers prefer this subtlety and enjoy the brewed flavor, Westerners are used to more flavor-forward beverages, and find the white teas too watery. White tea has been claimed to contain the highest anti-oxidant properties than any other tea on this planet. As a result, savvy companies like Inko’s and Revolution have combined two hot trends—bottled iced tea and healthful white teas—into lines of flavored iced teas. Revolution iced teas are all unsweetened, and Inko Tea has a mixture of unsweetened and slightly sweetened. The company has recently added four new flavors to its line up of bottled white iced teas. Unsweetened Honeysuckle is calorie-, carb- and sugar-free. Apricot, Cherry Vanilla, and Lychee are lightly sweetened with fructose crystals; each 16 ounce bottle contains less than 60 calories and 14 grams of sugar. Are all naturally flavored with fruit and flavor extracts. Read our review of Inko Teas here. For more information about tea, click here to read Tea Facts. Coffee Challenges the U.K.’s Tea. Since the 1600s, tea has been a staple beverage in England. The British Empire’s expansion was due in part by the search for land to grow more tea plants. With the centuries of tea-drinking in England, a cuppa is practically symbolic of the nation. So it may come as a strange surprise that Starbucks, the monolith American coffee chain, has is changing British drinking habits. 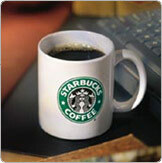 London already has about 200 Starbucks, which tops New York City’s 190 outlets. There are 466 Starbucks in the U.K., in addition to the fast-growing number of local chains like Caffe Nero and Coffee Republic. According to the market research company Mintel, tea sales in the U.K. have declined 12% in the past five years—likely be linked to the Starbucks invasion. While coffee has found its niche in Britain, the Tea Council, a trade association for U.K. tea manufacturers, finds that Britons still drink tea 10 times the average of Americans and more tea per capita than people of any other country, excluding Ireland. Though tea is available at coffee chains, about 90 percent of tea drinkers in England take their strong and milky tea at home—probably because one cup can cost as much as £1.80 ($3.15 U.S.) at a shop (don’t we know it!). It is interesting to note that in 1998, the first Starbucks shops in the U.K. struggled through high real-estate costs and problematic management. After a change of hands in leadership and expansion into towns across Britain, the Starbucks boom set off a cue for other chains to follow suit. Local coffee shops began offering lattes and frappuccinos, which have become particularly popular with the young, urban workers. In stark contrast to the fresh-brewed beverage Americans have long savored over breakfast, British coffee has historically been made primarily from instant powder. Now, our colleagues across the pond will come to the realization that for what they spend a year on cappuccino, they could own a [fill in the blank here with whatever high-priced item you could own instead]. Almost half of all specialty food consumers are between the ages of 35 and 54 years old, while over a third are buyers that are 55 and up. Sixty-four percent of all purchasers are female. What we buy. The top three overall most purchased categories of foods are coffee/tea, cheese, and chocolate, which correlates with the higher percentage of female shoppers. 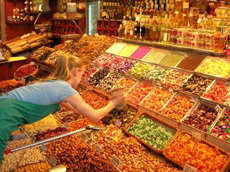 Younger purchasers as well as females are highly likely to buy specialty food items for personal rewards; older adults and males who often buy fancy foods for special occasions or as gifts for friends or guests. Ready, set, shop! Photo by Murat Cokal. 62 percent of specialty food consumers also buy natural foods. Photo by Sergio Armenio. What may not come as a surprise: the specialty foods that women tend to buy are sweets like chocolate or cookies and indulge in gourmet coffees and tea, while men are much more likely to purchase meat, barbecue sauces, and condiments. What we spend. More than half of specialty food consumers spend $76 or more on food that will be prepared at home and 18 percent dish out over $126 each week. A little less than half of the respondents include specialty ingredients into meals regularly. Where we buy. 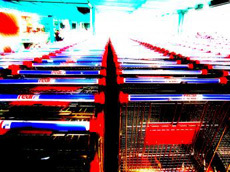 Only 16 percent of specialty food consumers buy food online—although the number is growing (and Nibble readers obviously rate much higher in this category, since we know there are exciting foods to be found online that are not readily available locally). Our lifestyle. About 61 percent of specialty food consumers claimed that one of their top leisure activities is dining at restaurants and a high percentage of these diners are often open to a variety of cuisines. The study also shows that specialty food purchasers also consider themselves knowledgeable about food, look for new ingredients to use in recipes, enjoy hosting parties, drink wine with meals, and entertain guest on a regular basis. More White Truffles: Mother Nature's Gift of the Season. This Thanksgiving, an abundant harvest of musky white truffles is something to be thankful for. The dry summers in Italy and Croatia have resulted in bumper crops of fragrant white truffles, which means that they will be sold at lower prices of “only” about $100 per ounce, compared to last year’s price of $300 per ounce. On average, the white truffle can cost between U.S. $1,200 to $2,300 a pound—about ten times more than what other truffle varieties cost. Better yet, the stock of these rare and exquisite morsels is predicted to last all the way through mid-January even though the peak truffle season usually runs just from late October to early December. So, think of them as holiday gifts for your favorite foodies! White truffles, typically found growing several inches below ground near the roots of oak and hazelnut trees, may be the second most expensive food in the world after fancy caviar. Thankfully, white truffles will be available a lot longer this year—long enough for all the holiday meals and at lower prices. Photo courtesy of AsiaCuisine.com. California: More Cheese Than Wisconsin! Many consumers have looked to Europe for the finest cheeses, but in recent years, California cheese producers and dairy farmers have been winning national and international awards for their great artisanal cheeses. 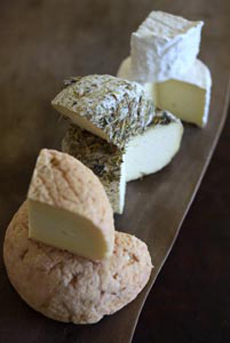 Over the past decade, the number of California cheese varieties has jumped from about 70 to 250. Most Americans think of Wisconsin as the leading dairy state, but California surpassed Wisconsin in milk production in 1993 to become the leading dairy state in the United States. Approximately 46 percent of all milk produced in the Golden State goes into the making of cheese and nearly one out of every five pounds of cheese produced in the nation is from California. From 1970 to 1997, although U.S. milk consumption was down 22 percent, cheese consumption was up 143 percent. That’s a 39 percent increase in per capita cheese consumption from 1985 to 2004, growing from 22.5 pounds to 31.2 pounds of cheese consumed per person (sometimes, we think we pack that away in the course of a few good parties); and is projected to reach 36.5 pounds by 2015. These California beauties are from Marin County’s Cowgirl Creamery, on the far side of the Golden Gate Bridge. California's consistent growth in cheese production stems from the increasing national demand. While California cheesemakers include some of the world’s great artisans, about 90% of the cheeses shipped from California are commercial varieties of Mozzarella, Cheddar, and Monterey Jack. Monterey Jack: Native Son. California produces more Monterey Jack than any other state. It is considered a “California Original,” a descendent of a type of cheese produced in the California missions more than 200 years ago. In 2004, California produced approximately 291.1 million pounds of Jack cheese. For additional statistics or information on California cheese, you can click here to visit the California Milk Advisory Board. • AltiPlano Gold introduces instant quinoa hot cereal in Oaxacan Chocolate, Chai Almond, Orange Date, Spiced Apple Raisin, and Regular. Quinoa (pronounced kee-nwa) is a 5,000 year old grain and a staple food in many South American diets. Containing more protein than any other grain, quinoa is packed with all 8 essential amino acids. It’s also high in calcium, iron, fiber and phosphorous, AltiPlano Gold quinoa is organically grown and made with all-natural ingredients. If you haven’t had quinoa, try some at home instead of rice or potatoes: it’s not only delicious and nutritious, but it’s a high-fashion grain, served by top chefs at the finest restaurants. • Rush Cola is a herbal-enhanced soda with no artificial flavors, colors, sweeteners, or added caffeine. Sweetened with natural cane sugar and infused with herbs, ginseng, and other roots, it was first exhibited this past weekend at the Expo East Canada. This is one rush that’s better for you. Beluga Caviar Ban. On October 1st, the U.S. Fish and Wildlife Service ordered a ban on all beluga caviar from the Caspian Sea to protect falling sturgeon stocks. The ban applies to the meat and eggs imported from Russia, Iran, Azerbaijan, Kazakhstan, and Turkmenistan. The U.S. had placed the ancient fish on its endangered-species list last year, but the producing countries failed to enforce any plans to preserve the fish. Overfishing and poaching are rampant, especially since the end of the Soviet Union, which applied unified regulations and supervision. According to a study published in mid-September by the American Association for the Advancement of Science of this year, stocks of the beluga sturgeon, already in peril, had declined as much as 30 percent since mid-2004. Beluga caviar from the Caspian Sea is now banned from the U.S. Fortunately, Black Sea beluga is still available, and sturgeon caviars from other sources including California, Tennessee, and South America, are being developed. 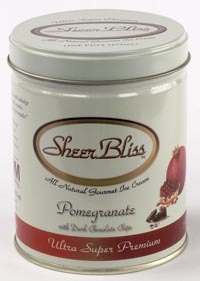 Photo courtesy of Mackenzie Ltd.
Pomegranate Bliss in a Tin. A new line of ultrapremium ice cream heralds that it’s special in two ways. First, the flavors are pomegranate based. Second, it arrives in fancy tins instead of coated cardboard or plastic. Called Sheer Bliss, the company has an exclusive agreement with POM Wonderful, creators of the bottled fresh pomegranate juice. Riding the pomegranate wave, they blend POM Wonderful Pomegranate Juice into four pomegranate-accented ice cream flavors and an ice cream bar, plus three standard flavors. The Florida-based gourmet ice cream company, which debuted at the Fancy Food Show in July, has now ventured north and can be found in specialty food markets New York City, New Jersey, and Connecticut. Hopefully, national expansion will follow soon. Made with top-quality, all-natural ingredients, the pomegranate-based flavors include California Pomegranate, Vanilla with Pomegranate Swirl, Pomegranate with Dark Chocolate Chips, and Freedom (a combination of vanilla, pomegranate, and blueberry flavors). Why a tin? It protects against freezer burn, keeps the ice cream colder...and it can be recycled to hold tea, coffee, sugar, and pretty much anything. The Pomegranate Bar is a block of pomegranate ice cream on a stick, dipped in a dark chocolate shell. Those wanting a break from fruit can choose ice cream in Chocolate, Vanilla, and Mediterranean Coffee. And an equally indulgent treat is The recent launch of another pomegranate-based product has been ideal timing, especially with pomegranate's relatively new role as a superstar known for its anti-oxidant rich properties and overall health benefits. A Glass of Summer Available All Year Long. Fresh orange juice isn’t the only juice you can get year-round to strengthen your immune system. Sundia Corporation has become the first mass-producers of watermelon juice, an equally healthy alternative to acidic orange juice. In recent years, watermelon has gained widespread recognition for its health promoting status. Beyond its sweet and refreshing taste, watermelon has high content in vitamins A, B6, C, potassium, and cancer-fighting lycopene—some of the most powerful antioxidants needed to combat free radicals in the body. More importantly, the body readily absorbs the lycopene in watermelon as compared to even tomatoes, a fruit thought to most efficiently soak up the lycopene. Lycopene is an open-chain unsaturated carotenoid that imparts red color to tomatoes, guava, rosehip, watermelon and pink grapefruit and is a proven anti-oxidant. Believed to have originated from the Kalahari Desert in South Africa, watermelon has been one of the oldest fruits known to mankind. A well-loved fruit because of its thirst-quenching properties, watermelon has only recently been discovered as a super food that studies have suggested combats the risk of cancer-causing agents or cardiovascular diseases. Better yet, fat- and cholesterol-free, 100% sweet watermelon juice is beneficial to people of all ages. Though primarily offered in California, Sundia plans to distribute nationwide within the coming months so everyone has the chance to soak up summer one glass at a time. Organic Food Soars. Sale of organic foods are predicted to hit $15 billion this year. Although the demand for conventional grocery products has grown by 2 percent to 3 percent, the same demand for organic foods has grown by 20 percent. Reasons for this trend may be due to environmental and health concerns: the USDA organic certification sets stringent guidelines on the methods, practices and substances that can be used in the production and handling of crops, livestock, and processed products. They prohibit genetic engineering methods, ionizing radiation, and sewage sludge for fertilization, which is assuring to people who like to know exactly what they are eating. 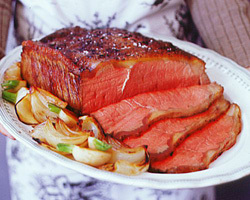 To read our recent review of organic and specialty beef in this month’s magazine, click here. You’ve Got the Golden Ticket. Dagoba, one of the finest brands of organic chocolate, has expanded into a 14,000-square-foot factory in Ashland, Oregon,that now includes a retail area and a factory tour. Situated in the lovely Rogue Valley, Nibble readers passing through the area are encouraged to drop by (and also to stop at the Rogue Creamery for some excellent cheese). Organic chocolate is a subgroup of the specialty, high-end chocolate market (a fragment of the roughly $15 billion chocolate industry). The organic industry is growing 20 to 30 percent annually, and chocolate is growing with it. 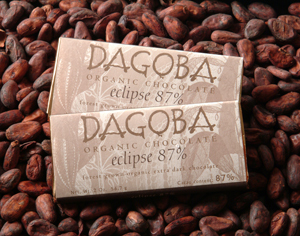 Dagoba produces 15 bars in a variety of cacao percentages and flavors such as Brasilia, Chai, Latte, Lavender, Lime, Mint, Mon Cheri, and Roseberry; a new line of single-origin chocolates (cacao from one country or farm); drinking chocolates; baking powder; cacao nibs; chocolate-covered beans; and chocolate syrup. The company is in the process of developing a line of truffles. All products are Kosher and many are Fair Trade Certified™. They are available at specialty retailer, e-tailers, and from Dagoba’s online store. Dagoba uses organic cacao beans from the Dominican Republic, Costa Rica, Panama, Ecuador and Peru. They are roasted and ground locally, then hardened into 55-pound blocks and shipped to Ashland, Oregon, with orders taking four to 12 weeks to arrive in Ashland. With certified organic chocolate (bearing the “USDA Organic” label), no chemical pesticides or fertilizers are used, beans are not fumigated with methyl bromide (a carcinogen and ozone-depleting chemical banned by most other countries) and organic beans are not mixed with non-organic ones. All other ingredients are also certified organic in accordance with USDA Certified Organic regulations (sugar, essential oils, fruits, and nuts), are GMO-free and non-irradiated. Dagoba’s bittersweet Eclipse Bar is 87% cacao. All suppliers undergo regular inspection by a third-party organic certification agency to obtain an organic certificate and maintain their certified organic status. Any product can claim to be “all natural”: the term has no legal meaning and is not regulated. It does not mean that the cocoa is organic, or free of chemical application and residues. Dagoba is a Sanskrit word, the short form of dhatu-garbha, an allusion to the dome of a temple, allusion to the primordial, creative waters. Colors of the Rainbow. 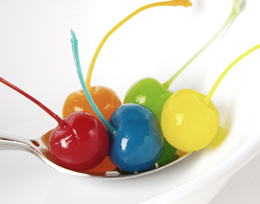 With today’s rainbow of vibrant-colored cocktails, juices, sodas, and even mineral waters, it was just a matter of time until matching maraschino cherries came along. In fact, Whyte's new line of flavored, colored cherries recently premiered at the annual National Restaurant Association Show in Chicago. The cherries in the photo at the right weren’t created by computer: these are the actual product colors, with flavors to match. Choose from Wild Berry Blue, Lemon Yellow, Passion Fruit Orange, Lime Green, and a cutting edge Chocolate Burgundy (the red maraschino tastes like chocolate). The shelf life is up to 18 months unopened and up to 6 months opened and refrigerated. Expect to see them soon in a cocktail near you. They’ll also be available for consumer purchase. And look forward to the Ultra Shirley Temple: a ginger ale with five cherries: one of each color. suit all kinds of parties and seasonal themes. Soy Is Here to Stay. According to Mintel International, a marketing research group, consumers are losing interest in soy-based foods and drinks. Although the soy market continues to increase, studies suggest that growth has been at a slower pace between 2003 and 2004. Sales were up only six percent versus a 17 percent jump from 2001 to 2002. However, the market is projected to grow 20% in constant dollars by 2007, to $2.3 billion. Soy-based food and drink has shown to be an alternative protein source for consumers who have chosen to reduce consumption of products containing animal proteins (meat or dairy). In addition to providing a vegetable-sourced protein, soy is credited by the FDA as an ingredient that contributes to heart health. Other benefits that are still in consideration are its cancer-preventing properties and natural estrogen replacement capabilities. While some researchers predict the slower pace is due to the change in attitude towards soy as a platform for health, other experts suggest that with the integration of soy in products like milk, energy bars, and other foods, soy is quickly being incorporated into the daily diet. Despite a slowing growth rate, there are still delicious new soy-based foods in the market. 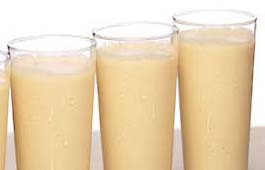 We love Pearl Organic Soymilk (shown above in Tropical). The study “Soyfoods: The U.S. Market 2005,” showed that soyfood sales hit $4 billion in 2004, a 2.1% growth—the slowest year-over-year increase for the industry since the 1980s. Another 2004 Mintel study found that 27% of respondents would purchase soy-based products, down from 30% in 2002. But these macro trends do not mean that people still don’t discover great soy-based products to enjoy everyday. Read our review of Pearl Organic Soymilk here.